The ecological debt concept emerged in the early 1990s from within social movements driven by rising environmental awareness, emerging consciousness of Western responsibility for past colonial subjugations, and a general sense of injustice during the third world debt crisis. First developed organically, mainly in locally-scaled, civil contexts, ecological debt has since gained attention in academia and international environmental negotiations. The concept of ecological debt requires further elucidation and elaboration, especially in light of its historical interconnection with environmental justice. 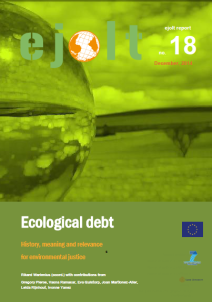 In this paper, the development of the concept of ecological debt in both activist and academic circles is described, theoretical building blocks for its operationalisation are discussed and three brief cases illustrating its recent utilisation are presented. Drawing on these building blocks, the concept of ecological debt has been used as a biophysical measure, a legal instrument and a distributional principle. In theory and in practice, it has much to offer to the global environmental justice movement. We conclude by reflecting on some of the pros and cons of the ecological debt concept as a tool to be used in fulfilling some of the goals of environmental justice movements in the world today.